Sleep is an essential part of our health and well-being. Sleep isn’t a luxury but crucial for good health. Research shows that insufficient sleep has been linked to chronic diseases and conditions such as Type 2 diabetes, cardiovascular disease, obesity and depression. How many hours of sleep do you get? Do you have trouble falling asleep? Do you feel sleepy during the day? Do you suffer from Shift Work Sleep Disorder (SWSD)? 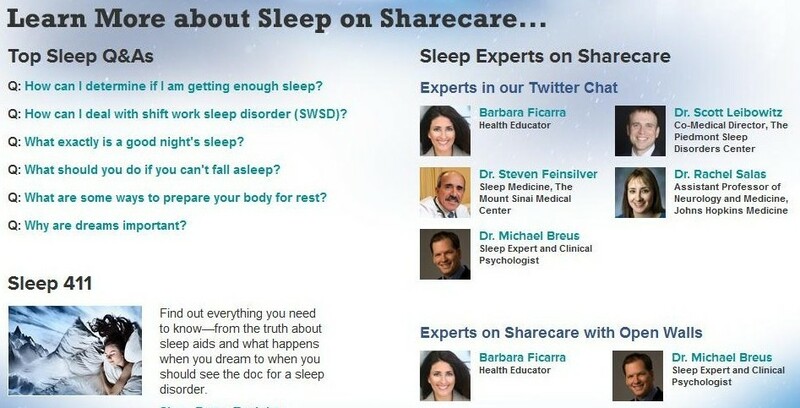 Join the twitter chat and learn how to improve your sleep, find out how much sleep is enough, learn about shift work sleep disorder (SWSD), find out the symptoms, and discover ways to deal with it, plus lots more. Sharecare created by Jeff Arnold, founder WebMD and Dr. Mehmet Oz, a leading cardiac surgeon, health expert and Emmy-award winning host of “The Dr. Oz show” is an interactive, social Q&A platform designed to greatly simplify the search for quality healthcare information and help consumers live their healthiest life. We hope you will be able to join us for Sharecare’s Twitter chat on Tuesday, January 24th from 12 p.m. to 2 p.m. EST. Ask us your questions about sleep and we will answer them. As always, thank you for your valuable time.